Ironically, the current manifestation of The Cherry Orchard, Chekhov’s last and arguably greatest play about the decaying end of a House and an era, is the inaugural play in a brand new Sydney theatre space throbbing with hope and potential for a vibrant future. It’s a truly odd mix, as one moves from the delightfully lo-fi, brightly coloured exposed wood chic of the newly built foyer, into the well organised one hundred seat theatre that sits in an ‘L’ shape around a decent sized stage, to suddenly be immersed in the tragic world of Ranevskaya and watch as its talisman – her family home – is twisted and shifted out from under her. It turns out to be a rather fascinating theatre experience, a true encounter with something terribly old and decaying and something that couldn’t be newer and more hopeful. An alluring triumph of enthusiastic can-do against the swollen inertia of the play’s central character, and its central premise. 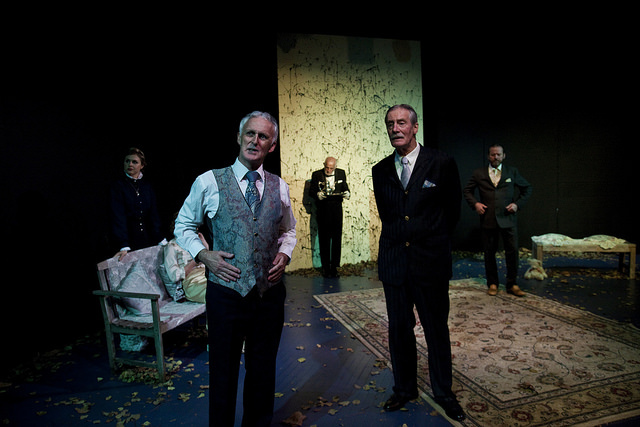 One can’t help feeling Chekhov’s words reverberate around the fresh paint, particularly as the Surf-made-good Lopakhin is played by David Jeffrey, one of the conveners of The Depot Theatre and the man with the hands that built it from scratch. This phenomenon is worth the modest price of a ticket alone, and shows a remarkably astute sense of programming and timing. It also speaks to the expansive pleasure of theatre and it’s all important relationship with space, time and immediacy. And the pleasures don’t end there. 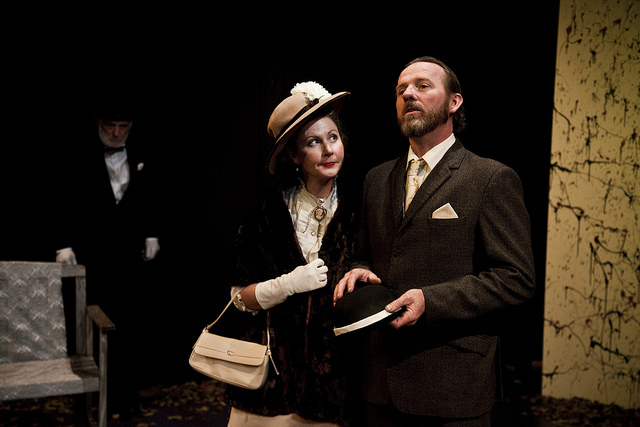 This Julie Baz directed version of The Cherry Orchard has a wonderful time playing with the equally dark and light script, bringing out an immersive experience that one can’t help relating to via the obsession Sydney-siders have with possessing property and the shifting nature of emblematic wealth. David Jeffrey bring a contemporary twist on Lopakhin, that I confess I struggled with at first, but which grew on me after interval as the connection was made between Russia in 1904 and Sydney in 2015. He ends up bringing one of the stand out performances of the night, as gradually the stuffy old-worldliness of the other characters fades into a nonsensical, if tragic, demise. 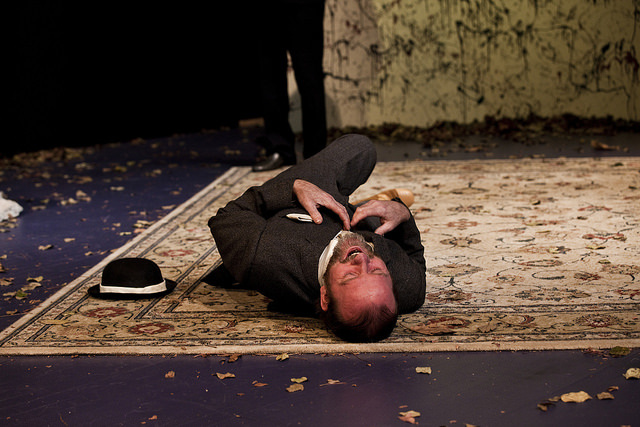 One of the difficulties of Chekhov is his fascination with inertia and it is David Jeffrey who effectively delivers the frustration we all feel with those clinging to class nuances that they do not realise have lost their value. Another stand out of the evening is Roger Smith as Firs, the constant reminder of both the death of the old world and the birth of the new. 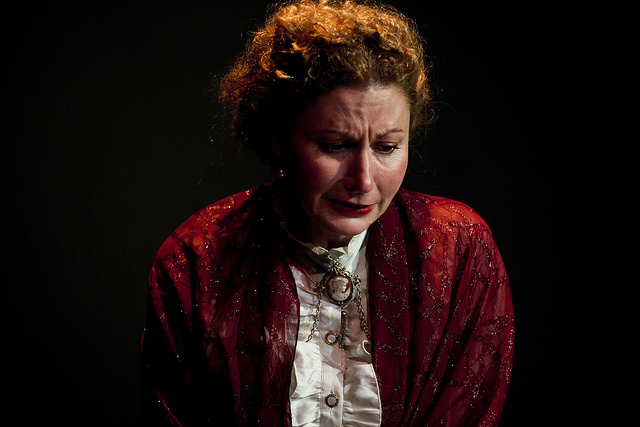 One of the best things about The Cherry Orchard is the peculiar behaviour of the staff at the ancestral estate – it takes us a while to recognise Dunyasha (Anne Brito) as a maid – and their mix of old world existence posited against their thoroughly modern behaviours. Smith bring this metaphor to a perfect realisation through Firs, who equally embodies the pathos and comic mix that the play manages to present. He is a loud, bumbling almost vaudvillian Firs, and yet as the play moves through its paces, he is equally wise, and tragic in his overwhelming nothingness. Roger Smith has us come to terms with what it must be like to be highly skilled at a job the world no longer has any use for, and employers one no longer respects, as the world moves in a direction you didn’t anticipate. 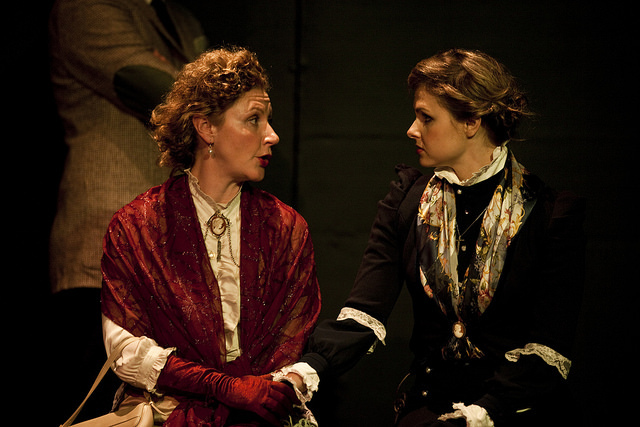 But all the cast are strong in The Cherry Orchard – it does make it difficult to single any of them out. Equally strong are Cherrie Whalen-David as Ranevskaya (her delightfully deadpan self-indulgence is played with a realism that genuinely evokes sympathy) and Theo Kokkinidis as Trofimov, the Bolshevik-political-theory-sprouting eternal student who was banned in many of the productions in Russia (and whose spiritual ancestors are in abundance in Sydney today). When Kokkinidis speaks Trofimov’s lines (my favourite from the play) the room comes to life, as it always does under the passionate spirit of the revolutionary. 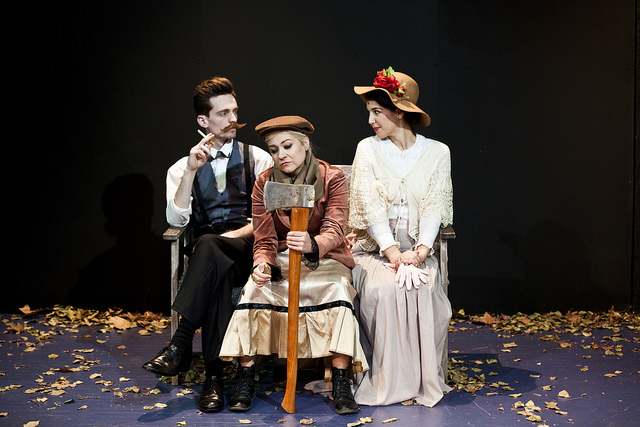 They’re accompanied by Emily McGowan as Anya, Justine Kacir as Varya (there is a strong temptation to scream “Marry her” from the house toward to the end of the play) and Leo Domigan as the hapless Gayev; forever, literally, behind the eight ball. To crown the elite off is Dave Kirkham as Pishchik – and can I just say how glorious it is to see him in full flight when able to use his talent for great comic timing. Julie Baz – in her cleverness – creates a subtle yet distinct distance between the servants at the house and the rising independence, and the owners of the house, confused by almost all developments. Behaviours in the elite are studied, closed and follow an established order they took no part in creating, while the servants are almost wild and silly with the promise of their impending economic freedom (They reminded me of people new to Facebook). Myles Burgin as Yepikhodov the charmingly bumbling foil and his rival James Smithers as Yasha are appropriately more concerned with their futures, Yepikhodov his economic and romantic future and Yasha the opportunities that might come his way that he can take advantage of in any way he sees fit. The two young men represent the best and the worst possibilities awakened by the impending social revolution while the practical Charlotta (Jane Angharad) is willing to accept whatever fate comes her way. Triumvirate is brought to the fore through Baz’s direction and poses interesting questions about what sort of future we may all be subject to that has nothing at all do to with the opinions of the previously ruling cast, as they barely even notice them. So, this all ends up being a very interesting night at the theatre in Sydney. The Cherry Orchard is not the sort of play one expects to excite a freshness of ideas, but performed by this company, under this director at this time and in this city, it turns out to be an exciting contribution to the 2015 Sydney theatre calendar, and one not to be missed.